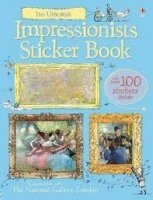 For budding aficionados of art, children can have fun matching the stickers of famous Impressionist paintings from the National Gallery to their labelled frames, learning about the most popular works of art and their artists as they go. Each frame and painting is accompanied by a plaque of fascinating facts about the piece and its creator. Each charmingly illustrated double spread is based upon a simple theme such as painting outdoors, color and everyday life. It contains over 100 stickers.